Creating professional, polished mixes just got a lot easier and more affordable. The Producer Factory™ bundle augments your Pro Tools® plug-in collection, offering seven professional Digidesign®/Bomb Factory® plug-ins at incredible savings. These plug-ins are collectively worth nearly $1,100 (USD) if purchased individually, but you can have them all for just a fraction of that cost. Unleash your creative potential and add warmth, edge, character, and excitement to your Pro Tools LE® or Pro Tools M-Powered™ mixes. 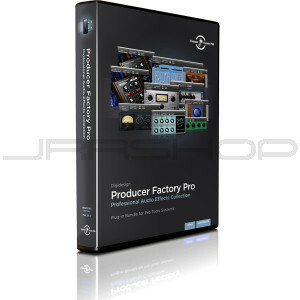 Producer Factory comes with seven powerful Digidesign®/Bomb Factory® plug-ins to help you improve and enhance individual sounds and mixes, as well as add unique effects to spice up your projects. Here’s what’s included. The Producer Factory bundle provides yet another reason for you to join the Pro Tools® user community. Bomb Factory™ plug-ins are considered among the best in the music production world, offering intuitive interfaces and outstanding sonic results. By including both Bomb Factory plug-ins and innovative Digidesign plug-ins, this bundle can help you unleash your creative potential.